Personal observations on general life. Well, after awhile of not adding anything to this site since before we left in the Summer of 2011 to begin our itineration process, we’re back. We’ve been busy beyond busy and yet not in the way you’d think. Since February, we’ve been the senior pastors in a small, Upstate New York Assembly of God church and it’s unlike anything we’ve done before. “Tough” doesn’t quite seem to cover it, yet how we got here is the point. We were willing to do what God directed. He wanted Filipinos to take over the work He started through us and didn’t want us getting too attached to the work, as it seems. It was a hard, hard time this past winter as we struggled with hearing His voice clearly. There’s a lot to say about it all and maybe I’ll talk about it on my personal log someday, but for now, let it be known that although we are in the States, we are continuing to minister and support in a new way, the work God continues by His Grace in Cebu among the Deaf. A newsletter has just been published and after taking a look at the pictures, you can e-mail us for a PDF copy of it. Just visit the “Contact” above for the link. You can join us on the church’s social network very soon, as we’re getting everything online. Stay tuned. Truly, we’ll be updating at least once-a-week and we’ll put the links up as soon as we get them. Deaf Summer Camp begins on Saturday morning. The theme is from I Corinthians 1:27-29, “Confounding the Wise & Mighty.” We’ve been preparing in earnest this past week while getting everything ready and packed and sorted out for furlough. It’s been an interesting month so far. We are looking forward to what the Lord will do among the deaf this weekend and thank Him. We also thank you for your prayers. We’ll post pictures from the camp here next week. Yesterday, we were asked by a good friend and in leadership here on the field, what our biggest moment in ministry was this term. The relationship God established at the public school here was our definite answer. With that connection and relationship, everything else came together. But what about the biggest moment in our everyday life here? The biggest POSITIVE moment in just the daily living, day-in, day-out? The answer may surprise you. Since about the third month in our house, we have had Nature’s Spring water delivered to our house. For more than three years, the same fellow has delivered water CONSISTENTLY every Tuesday about 0930. He has always made change for the transaction when necessary even when we’ve had only larger bills with which to pay. He has never once tried, like everywhere else you go, to keep the change. Not once. He has been an honest, friendly, punctual and consistent fellow. HE and his help have been an incredible bright spot in this dark place called Cebu. Even in my reprobate days, I rarely took things for granted. When I did, something nasty always seemed to happen to me (having “fun” driving on icy roads when I was 20 comes to mind and the yard work I had to pay for when the car hit black ice and careened off the road – without hitting a single tree – into a front yard). But as a missionary in a dark place that has few scruples, everything has a heightened sense to it, like the taste of chocolate in a famine or the overwhelming joy of having a Bible in a gulag. And so our water delivery guys. It’s the little things of the everyday that we need to pay attention to. There, the jewels are revealed. I’ve gone through two watches since I’ve been in Asia-Pacific this term. Two. Less than four years – two watches. Both Timex Expeditions with green dials made, as it turns out, in the Philippines. I won’t go into the how’s and why’s, but let’s just say they both broke in ways that can only be explained in terms of bad production values slightly exacerbated by the vagaries of the tropics. In short, the quality was atrocious. 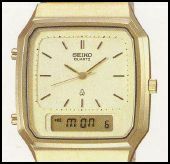 My first real watch, though, was a Seiko Quartz Analog-Digital Alarm Chronograph Calibre H449, purchased when I was 16. It was $265 back in 1982 [an incredible $599 in today’s currency! »] and I remember going into the jewelry store every week and making my small payment. It took months as I recall, but I can still remember taking possession of it. Wow. A real watch made by a company known for it’s excellence and commitment to detail. You could only buy their watches in jewelry stores or high-end department stores like Shillito’s ». No big box stores back then and the internet was only an insignificant military research sharing protocol. You looked for the outside of things to be nice and good looking, sure. But what you were buying was the inner workings, the calibre of the timepiece and the reputation of the company that manufactured it. For the greater part, you expected the thing to work well and for a long time. Back then, the junk always had “Made in China” or “Made in Hong Kong” written on it and you expected it to be junk. It might have looked incredible, but if it had “Made in China” emblazoned on it, you knew it’s guts were worthless… because they actually WERE. 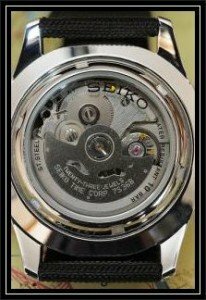 I had that Seiko Quartz for about 15 years and through no fault on it’s part, the glass cracked, condensation set in and before I could get it to a repair shop it stopped working. By then I could buy a new one so it didn’t bother me. It wound up in the ol’ junk drawer of bits and pieces. That was the period when the inner workings didn’t matter as much as functionality and, of course, form. Cheaper became more valuable than quality. Cheaper meant it didn’t matter what was inside because you could always get another one easy enough if it didn’t work. The world – worldview-wise – bought into the idea of “planned obsolescence” and “consumerism.” And that included me. “Quality” became a by-word that evoked ideas from our past and helped promote the junk. Like Billy Crystal’s “Fernando” would say on SNL no matter how stupid the situation, “I looook Mah-velous!”, we laughed, but we identified with the character. Looking good was more important than substance; more important than calibre. Fast forward to 2011. Two failed watches in less than four years. Timex, no less. The old days of John Cameron Swayze’s famous Madison Avenue maxim, “Timex takes a licking and keeps on ticking” » were long gone it seemed and, ironically, even helped fuel the whole worldview monster of consumerism – it’s cheap and it works! – mentality. Even though we are re-born in Christ, it takes awhile for our worldviews to match up with the really Real, but it MUST match up to it as we walk in the Spirit, you see, because without seeing Reality, we are still adhering to lies. They must drop off here and there as we go and we must understand what the Spirit is showing us. So I started looking for a watch because I needed one. My criteria this time was, first, that it have an automatic movement ». Nothing needing batteries to vibrate a quartz to keep the time and no winding that could possibly break a stem or over-tighten the mainspring. Movement-wound and mainspring-run was the ticket. Second, it had to be able to be immersed and used in water » – 10 bar/100 meter/330 feet minimum. Third, it had to be, obviously, as inexpensive as I could get it and could be nothing like the amount I’d spent at 16 – in real terms or otherwise. Something to understand, also, is that an automatic, self-winding timepiece is like owning a grandfather clock. It requires a hands-on approach. You have to pay attention to it. It doesn’t keep NIST Atomic Time from Boulder ». It requires a certain view of the world to own one. One that requires diligence, patience, and connection. Sound familiar? So at 46, as a man seized by the Power of a Great Affection with my consequent worldview change; my thoughts ran to my first timepiece. The importance of the calibre – the inner workings. The importance of reputation. Something of quality that would last me the rest of my life, no more slavery to consumerism and being a Walmartian. And so my search began. I had no intentions on brand whatsoever and even considered Timex again if I could find one not made in Luzon. I suppose my previous experiences with Timex before the two lightweight watches was pushing me to give them a chance still. But I was stunned that Timex considered itself a relatively high-end brand! Pricing was outrageous » considering the quality… but true to the worldview in vogue, they “woooook maahvelous!” and so they can get premium prices I suppose. And they also are riding on their past reputation I’d gather as well. The Invicta, even though Seiko has a minority ownership interest in them, had highmarks by all accounts for quality and the pricing was better than Seiko, but the problems came with the watch itself, the advertising the company feels is appropriate, and the sheer size of the thing which is like wearing a wall clock on your wrist. The watch itself, sadly, is remarkably similar to a Rolex Submariner ». I can appreciate getting design cues from a popular model, but aside from the name on the dial it’s nearly indistinguishable and that’s a form of lying and, let’s be frank, stealing. Then there is the advertising. It is completely inappropriate by any standard. Watches have nothing to do with bikinis, ’nuff said. So Invicta was out, regardless of the price point benefit. 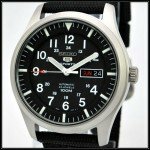 The military/flieger-type models came down to, well, Seiko. For all the reasons mentioned at the beginning (a german-made Laco is great too, but at $300-$600 dollars », cough). Seiko’s still got it, as the phrase goes. No one had anything bad to say about them and the calibre they use got raves across a spectrum of forums. And to say that it had superb inner-workings and an enduring reputation is the main issue is true, but they also made something that is quite stunning to look at as well – beautiful in it’s simplicity and directness and function. So what is all this about? Me finally getting a watch? No. It’s not. It’s not about me getting a watch. It’s about how we make choices. It’s about how a mundane enterprise like finding a timepiece seems like babbling rant when reading it, but it declares all the philosophies and knowledge that moves your feet to action within it. Every day you make choices, most of them mundane, but every one comes from a wellspring of worldview. Are you consumerist-oriented in your dealings with people? Would you put up with a watch that requires diligence, patience and connection? And if knowing that even with all that effort it will not promise to give you more than +20/-45 seconds a day, will you still persevere? Would you put up with it if you saw just how beautiful and high-calibre the inner-workings were? Would you, finally, put up with a person who requires these things? There are lessons to be learned and pondered in every decision. Sadly, we want everything to have a big bang or a sweet taste – anything but a hard look at our worldview. 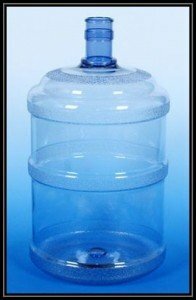 You could say that we want a quartz with +/-1 second a year so that we can move on to the next “big” thing, not thinking one whit about the handy 5 ounce device strapped to our body for 15 hours a day. Interesting when you think about it that way, eh?